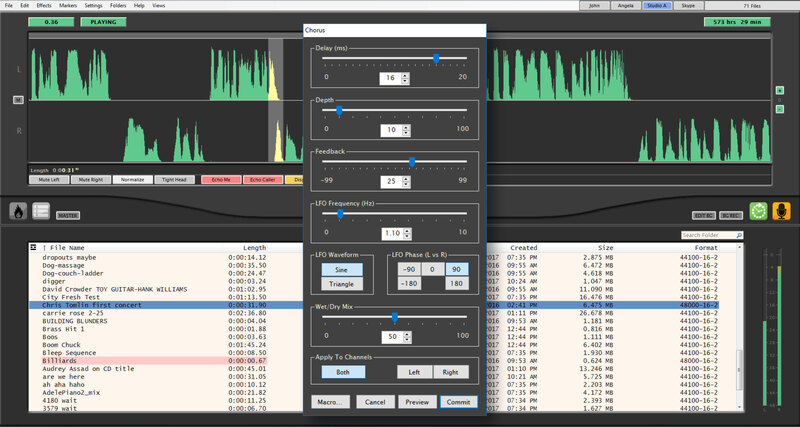 The standard tool for speeding live production in top 40 radio now speeds talk show production. First off, no other hardware or software solution lets you non-destructively edit a live production AS you record without stopping or altering the original recording. 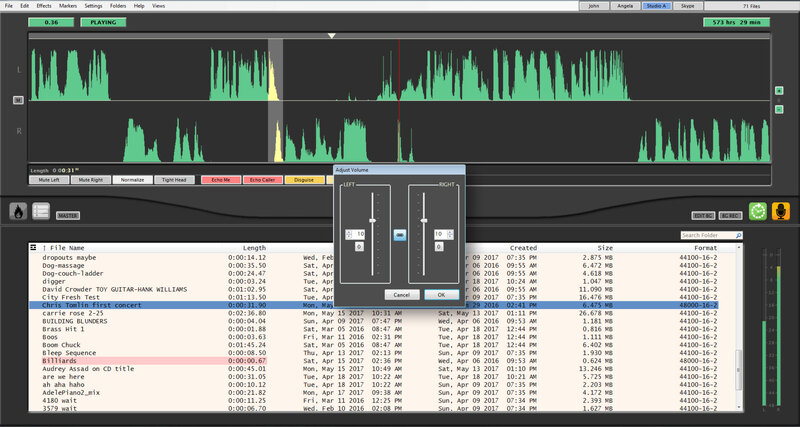 In addition, VoxPro’s intuitive jogwheel hardware interface makes finding and editing call-ins a snap. Additionally, Hot Keys give you instant access to highlights for production, teasers, etc. VoxPro is perfectly suited for rapid editing of studio and call-in content and can tighten an entire program by automatically removing unwanted dead space. Markers let you indicate, in real-time, material that needs review before prepping for distribution (streaming, podcasts, syndication, etc). 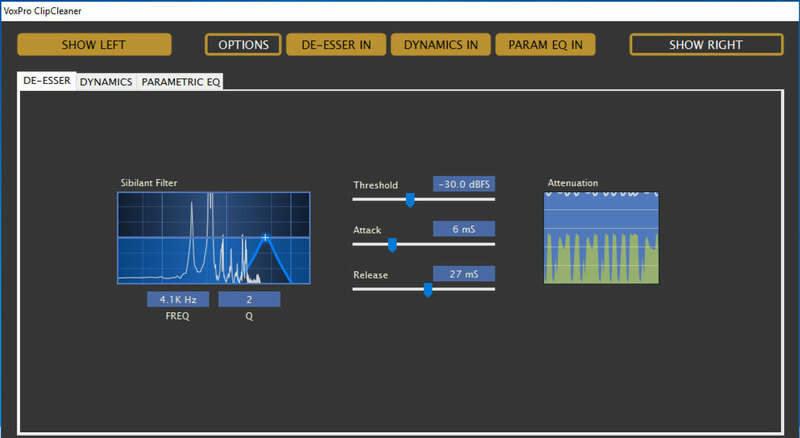 Plus you can clean up audio with EQ and dynamics processing, as well as add effects if you desire, either as you go or when you are prepping delivery for different media. Scroll down to see the tools VoxPro gives you and consider all the ways you can streamline your talkshow production. VoxPro’s main window is laid out to give you an overview of your audio files as well as an editing window to get right to work with the audio you select. 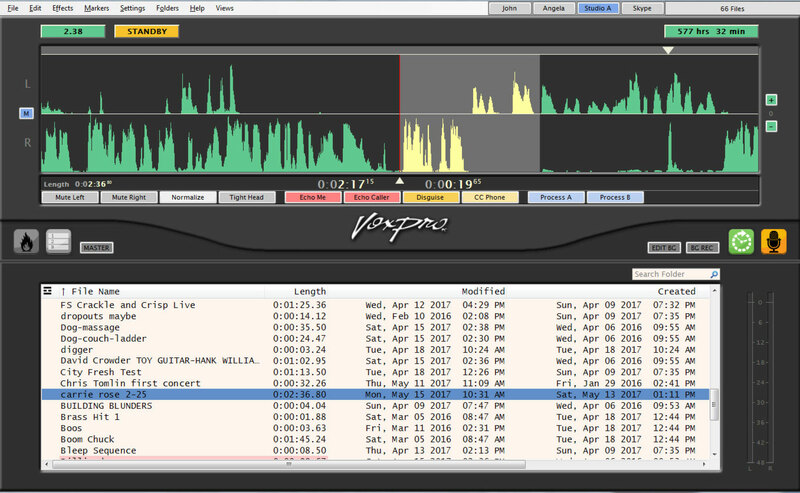 Recent additions to VoxPro include the WheatNet-IP routing assignment buttons at the top, background recording and editing indicators, and a detachable Hotkeys window. On-screen Hotkeys window with the ability to set-up an endless number of tab pages with up to 12 rows per tab, five Hotkeys per row. Drag and drop edited bits, music and sound effects. Play multiple Hotkeys simultaneously, or switch on exclusive Hotkey playback mode to stop any currently playing Hotkey when a new Hotkey is triggered. HotKeys for VoxPro 7.1 has been dramatically upgraded. Details here. Hotkeys have been extensively overhauled. 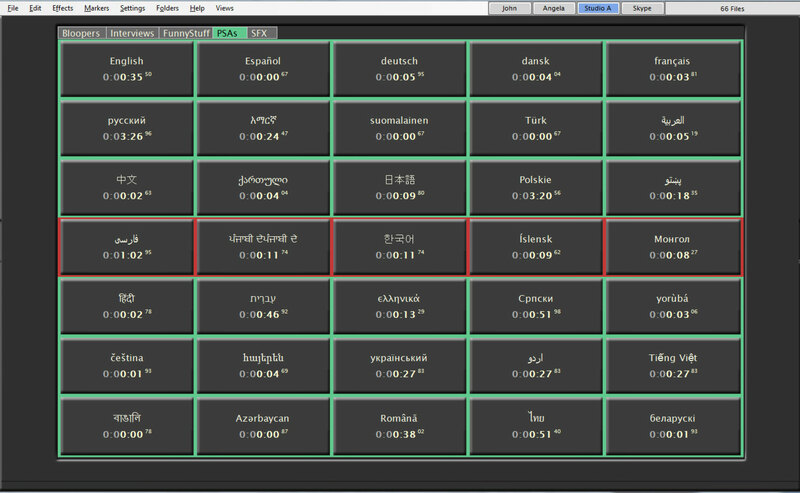 Multiple hotkeys panels may now be open simultaneously, each to a different page of hotkey cells. Remote access to hotkeys and all hotkey functions allows producer/talent teams to work together from different computers, one prepping and loading hotkeys, the other playing them to air. Hotkeys may now be looped and paused. A hotkey cell may be unloaded (cleared of audio), leaving other settings in place. There are more pad settings and more colors, and they load faster now. A new Settings/Hotkeys dialog provides controls for customizing hotkey layout and performance. Hotkeys windows may be opened from the View menu, or by right-clicking the Hotkeys button (bonfire icon) to the lower left of the waveform editor. Hotkey windows may be dragged to a secondary display monitor. All hotkey tab pages are accessible from all hotkeys windows. Administrator may restrict which audio playback devices are allowed to be displayed in a hotkey cell’s Playback Device dropdown menu, and provide optional labels for those devices which are displayed. These controls are accessible from the Audio Devices and Formats dialog, in the Settings menu. 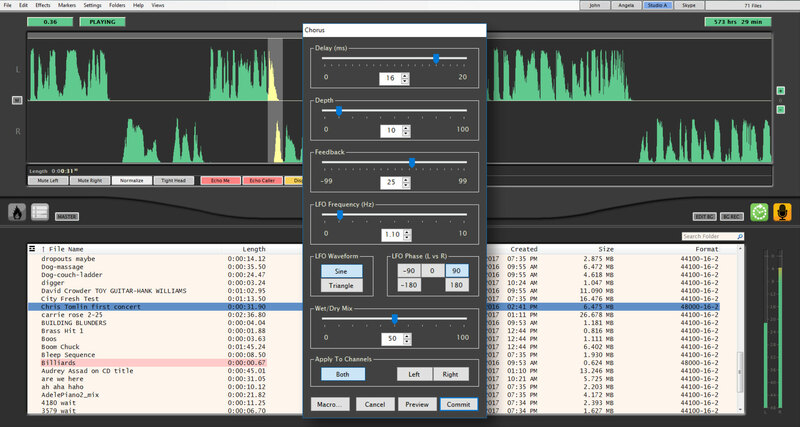 The VoxPro7 ClipCleaner toolset includes spectral display, parametric EQ, de-esser, compressor, expander, limiter and noise gate for processing channels independently or jointly to clean and enhance the quality of noisy phone calls, but of course it can be used for other purposes (e.g. special effects) as well. The De-Esser helps to control audio spikes (generally above 2KHz) that are a result of the pronunciation of sibilants such as “S”, “SH”, “CH”, “Z” and sometimes the plosives “T” and “D”. It is essentially a frequency-controlled ducker. 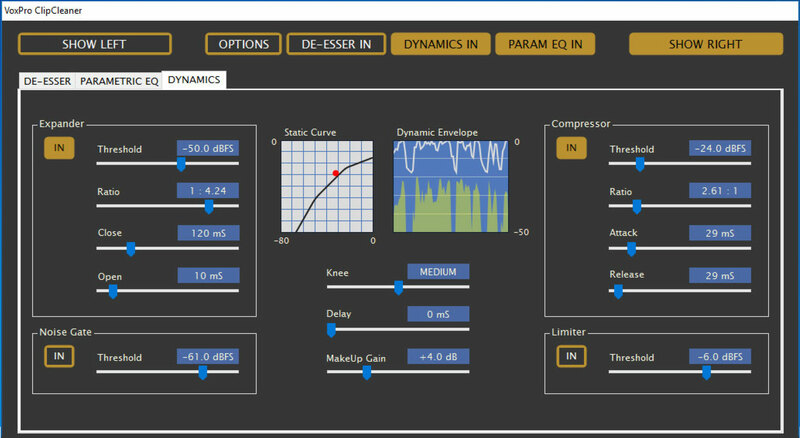 The Dynamics section adds expansion, noise gating, compression and limiting to your audio to help reduce background noise and level the audio to make the volume more consistent. 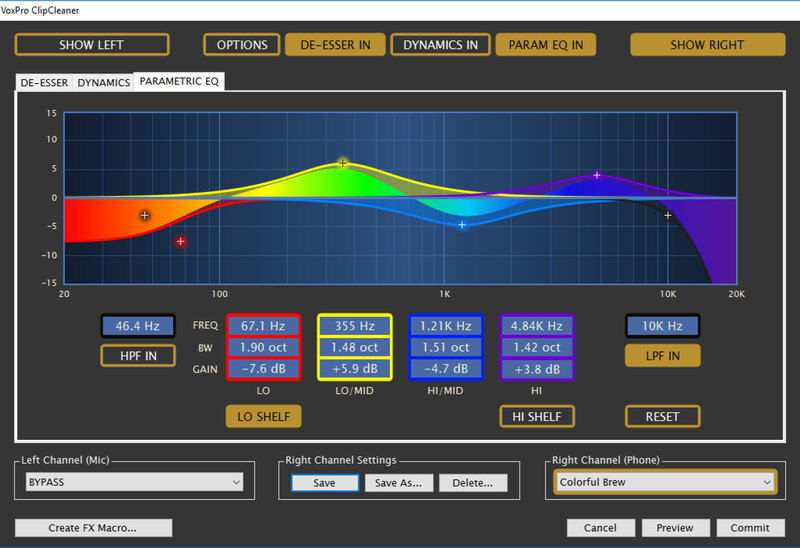 The Parametric EQ section offers six filters, four of which are fully parametric, as well as a high-pass filter (HPF) and a low-pass filter (LPF). 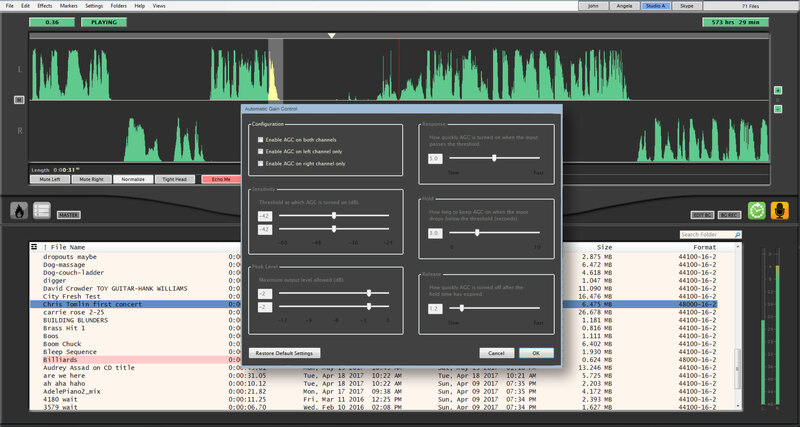 ClipCleaner brings an exceptionally powerful set of audio tools to VoxPro7, making it a true standalone audio workstation. Of course a jock would never have moments of awkward silence, but callers often do. With VoxPro’s GapBuster, you can set thresholds for the length of time a pause in the conversation lasts and replace it with your own preset timing, automatically. Its algorithm makes for absolutely natural-sounding conversations. With VoxPro, you can simultaneously record and play back audio. This is particularly handy when covering, for example, sports. Suppose you are recording a baseball game, but want to excerpt a teaser for news of a home run being hit. Nothing to it. Grab the audio, copy it, edit it, play it – all while the full game continues being recorded. 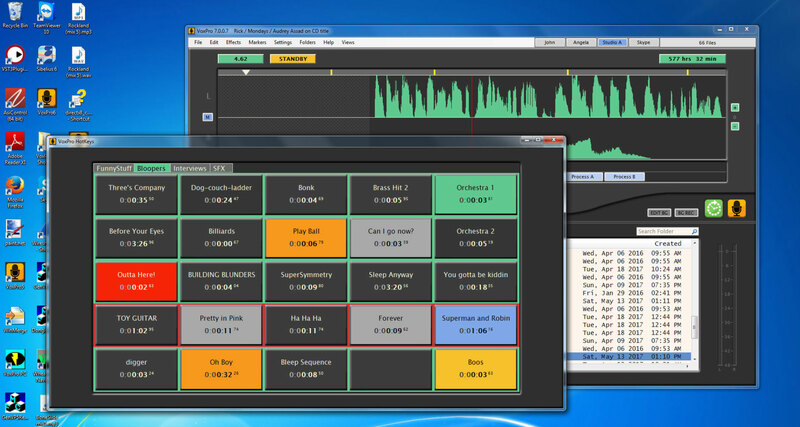 The MultiTrack Panel allows multiple audio files to be layered over the current active file. The top-most file in the MultiTrack Panel is the active file, displayed in its entirety. This is referred to as the “title track”. Because VoxPro was created specifically for live, on-air use, we came up with an editing interface that is simple and intuitive. It provides exactly the tools you need to edit the type of audio you are working with as fast and cleanly as possible, for immediate playback. Networking VoxPro workstations is totally automatic and pain free. How simple is it? Put two or more computers running VoxPro on your station's Lan and they automatically find each other, swap information and connect, allowing users to access their password protected accounts from those workstations. FX Macros provide a means to store commonly used effects on a dedicated button, which can then be applied to your mix with a simple mouse click or using function keys. 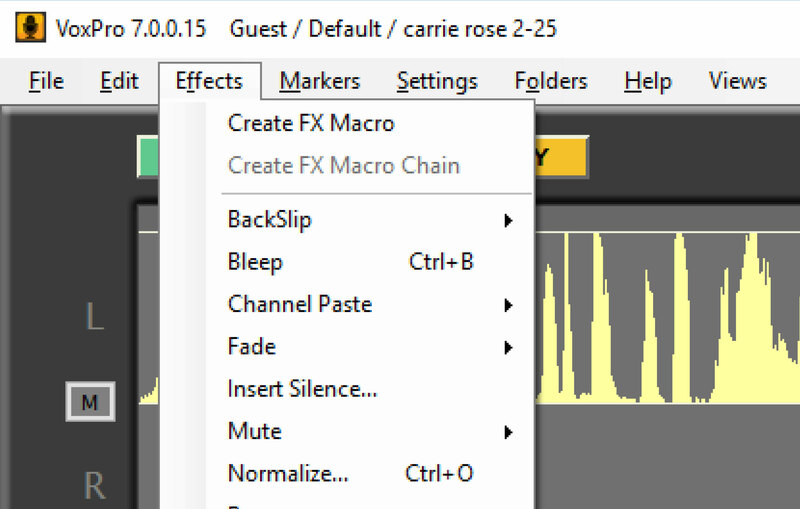 Once defined, you can chain FX Macros together in sequence. Like Hotkeys and tracks in the File List, macro buttons can be color-coded according to your own needs. They may also be re-arranged within the macro strip. The VoxPro7 Effects menu makes special effects such as chorus, reverb and distortion much more accessible. VoxPro7 offers a full array of effects for creative editing: It gives you Chorus/Voice-Doubling, Compression, Distortion (for adding harmonics), Echo, Flanger, Gargle (which modulates the amplitude of the signal), Parametric EQ, and Waves Reverb. The new editing windows for the effects provide more control over effects’ parameters. A voice may be raised or lowered in pitch without altering the time; a recording may be stretched or compressed in time without altering the pitch; or both effects may be applied simultaneously. Or go retro and use it like classic analog tape, where speeding up the playback rate raises the pitch, and slowing it down lowers the pitch. Automatic Gain Control continuously monitors the signal coming into the soundcard, turning up the volume when the signal is too low, and bringing down the volume when it gets too high. 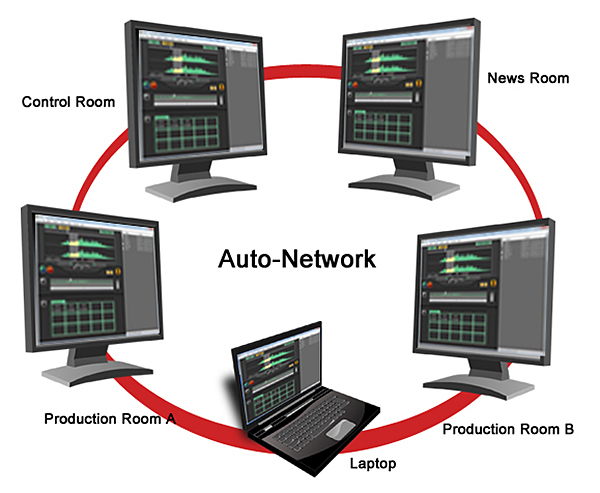 AGC is operational only when recording and operates on each channel independently (for example, the caller may need to be boosted, but not the jock). Part of the Effects functions, Adjust Volume changes the decibels on right channel, the left channel, or both channels during editing to allow you to achieve a balanced level. 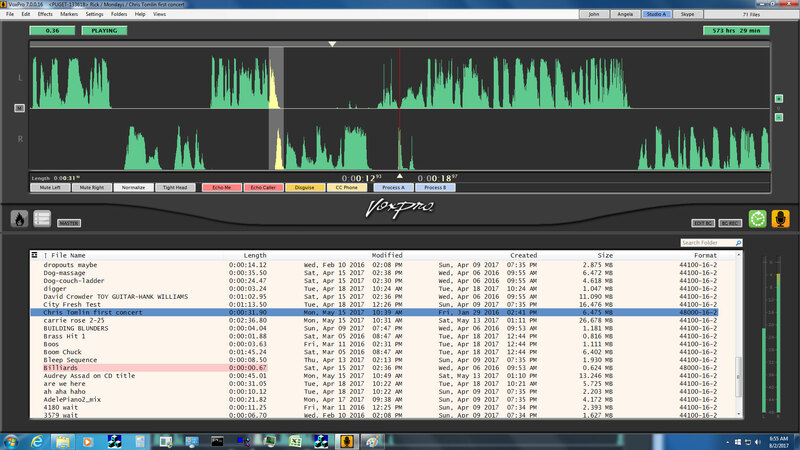 Handy when caller volumes fluctuate or when you are editing multitrack files. New graphical method to precisely position location of markers. Great for interviews, baseball or football games. Anything that will require documentation of “points of interest” in the file. There is also support for Unicode labels. VoxPro supports virtually any and every language and character set in the world. Regardless of which country on which continent you live, VoxPro can be localized. VoxPro fully supports WheatNet-IP. This means that all of the benefits of The Intelligent Network are available from within the VoxPro interface. 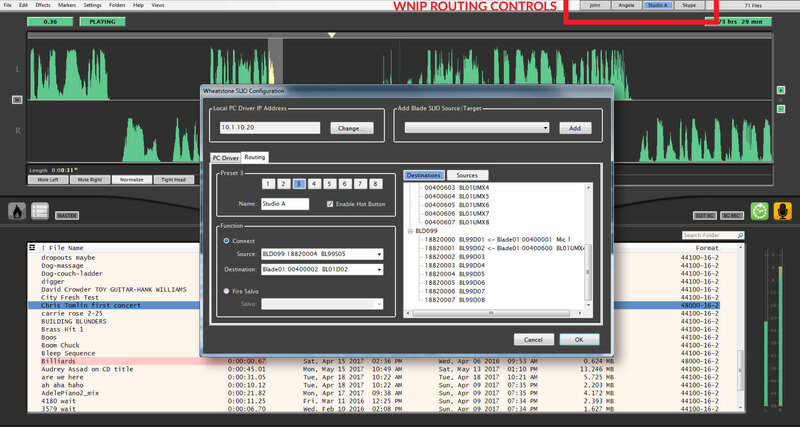 Assign sources from anywhere on the network to on-screen WheatNet-IP buttons and selecting a source is as easy as pushing that button. Likewise, your VoxPro audio becomes a source available to any BLADE or control surface on the network. VoxPro was designed by Seattle radio personality Charlie Brown in 1991. Brown, then the morning jock at Seattle's KUBE 93 FM, had seen a rudimentary audio editor on a Mac computer. He was intrigued enough to pursue a development partner, Buzz Hill—an old radio friend who knew how to write code—and with Charlie writing the specs and Buzz writing the software, ProVox was born. However, a quick search of tradenames showed ProVox was already in use, so the name was flipped to VoxPro. Brown was also instrumental in designing the VoxPro hardware control panel, keeping broadcast talent in mind as he laid it out. In 1993 Audion Laboratories, Inc. was founded and in 1994 the first VoxPro system on a Mac computer was sold to KHJ in Los Angeles. VoxPro stayed on the Mac platform through the iMac. In 2001 Audion ported the software program over to the PC platform where it resides exclusively today. In October 2015, Audion Labs and VoxPro were acquired by Wheatstone Corporation and is available from them today. Under Wheatstone, VoxPro will continue to be developed to provide even greater functionality. VoxPro can be found in radio studios and broadcast news rooms around the world. VoxPro has been honored for its excellence as a recipient of Radio World's "Cool Stuff " and Radio's "Pick Hit" Award which it won for a second time at the 2013 NAB. VoxPro is known for its stability, durability, speed, reliability and ease of use. VoxPro is the de facto choice for voice editing software in radio broadcasting. VoxPro most recently got a New Bay Best In Show Radio World award for VoxPro7 at NAB2017.